New York : [Jackson, Tenn.] : New Press ; Distributed by Perseus Distribution, 2010. Quoting Alexander: "I consider myself a prison abolitionist, in the sense that I think we will eventually end the prisons as we know them. That doesn’t mean that I don’t think we don’t need to remove people from the community who pose a serious threat or who cause serious harm for some period of time. But the question is do we want to create and maintain sites that are designed for the intentional infliction of needless suffering? Because that’s what prison is today. They are sites where we treat people as less than human and put them in literal cages and intentionally inflict harm and suffering on them and then expect that this will somehow improve them. It’s nonsensical, immoral, and counterproductive, and that is what I would like to see come to an end." Contrary to the rosy picture of race embodied in Barack Obama's political success and Oprah Winfrey's financial success, legal scholar Alexander argues vigorously and persuasively that [w]e have not ended racial caste in America; we have merely redesigned it. Jim Crow and legal racial segregation has been replaced by mass incarceration as a system of social control (More African Americans are under correctional control today... than were enslaved in 1850). Alexander reviews American racial history from the colonies to the Clinton administration, delineating its transformation into the war on drugs. She offers an acute analysis of the effect of this mass incarceration upon former inmates who will be discriminated against, legally, for the rest of their lives, denied employment, housing, education, and public benefits. Most provocatively, she reveals how both the move toward colorblindness and affirmative action may blur our vision of injustice: most Americans know and don't know the truth about mass incarceration—but her carefully researched, deeply engaging, and thoroughly readable book should change that. Every American should read this book; non-Americans can read it to feel relief that they don’t have such a system and possibly think about tacit discrimination in their countries as no nation can be free of such systems, though clearly most will not be on such a large scale. Michelle Alexander looks at the American prison system with a focus on the War on Drugs and how it is used to control minorities, specifically young African-American men. The book is clearly written, well-organized and cites statistics, case studies and personal accounts to give both the large-scale impact and the personal costs of the mass imprisonment of drug criminals. Alexander claims in her introduction that she didn’t want to write an enormous tome describing the injustices but her book is actually quite comprehensive. She lays out the stepwise progression of the system to its current form, where it can function with no necessary overt racism, generally hidden from view and on a massive scale. Alexander writes with an impressive clarity and sticks to a straightforward, factual tone even when dealing with enormous contradictions and injustices. Her prose flows well so the book never feels dry. She’s able to summarize historical eras, complex court cases and theoretical arguments simply and clearly but includes important nuances and looks at positions on both sides. In fact, she frequently lays out the arguments for the current drug war and punitive system then dismantles them with statistics and examples, logical counterarguments and enlightening juxtapositions. Alexander starts the book by giving a short summary of the two previous systems used to control blacks – slavery and Jim Crow, the set of laws and customs that developed after the Civil War and Reconstruction that kept minorities as a second-class citizen. Her biggest claim is that the War on Drugs and the prison system is the new Jim Crow, a highly emotional charge that is given strong support here. Whatever one thinks of that comparison, though, the author’s case-by-case depiction of the loss of any meaningful constraint on police actions and the long list of extremely harsh and unfair restrictions on not only those convicted of drug charges but those either charged but not convicted or just arrested for drug crimes is staggering. The beginnings of the current drug war are traced – a War on Drugs was actually declared before the spread of crack, long seen as the scary boogyman of drugs. Ronald Reagan is given much of the blame but Alexander is highly critical of Bill Clinton’s reforms and is doubtful of some of Obama’s actions. Being “tough on crime” became an easily coded way to appeal to the rightmost elements as well as poor whites and Republicans and Democrats would both use it – no one wanted to be seen as having sympathy for criminals. Alexander shows how government money was used to incentivize the arrest of large groups of drug criminals – almost all black or brown, she notes – and led to the militarization of police tactics. To point out some of the worst abuses – police are allowed to seize the property of drug criminals, giving them another incentive for arrests. Even those only arrested and not charged can have their property seized and a cumbersome process must be undertaken to try to get it back, leading to the idea of a piece of property having “guilt”. Laws were only reformed (and not by that much) when some especially corrupt police departments targeted white millionaires, hoping to seize a large estate if even a small amount of drugs was found and actually taking a helicopter. Out-of-proportion mandatory sentencing and punitive three-strikes laws are often discussed but Alexander gives the disparities of the crimes and sentences in detail. Alexander covers a list of Supreme Court cases and all result in giving police and prosecutors almost unlimited discretion in who to arrest and charge. Any limits in stopping and searching people are almost never used in fact – the issue with obtaining “consent” to search, for example. Police can stop someone for pretty much any reason – looking too nervous to too calm are acceptable reasons cited. They can also use race, as long as it’s not the sole reasons. Prosecutors regular overcharge drug criminals to force plea bargains and it’s well-known that public defenders are spread too thin. In choosing a jury, prosecutors can cite almost any reasons for rejecting a potential juror – the one given in the Supreme Court case was that the guy’s hair was too long. In fact, many of the decisions state that a racial bias cannot be charged unless there is clear evidence of someone doing something solely based on race which is unlikely. Statistics were not acceptable as evidence of bias. Attempts to obtain evidence showing racial bias couldn’t be pursued as in one case where the court decided that the evidence necessary to decide the case (a list of white defendants who weren’t transferred to the harsher federal system) was the evidence being sought in a Catch-22. This isn't an easy book to read, but it's important for Americans to read it. In it, Michelle Alexander sets out a convincing claim that our War on Drugs has resulted in shocking injustice. While the percentage of people who have used illicit drugs to some extent or another is the same across all groups of Americans, law enforcement has concentrated on African Americans to the point where they account for up to 90% of those charged. In low-income neighborhoods, being stopped and searched by police is a routine occurrence for young men and there are regular drug sweeps that pull the innocent as well as the guilty into the justice system. The justice system itself is skewed against low-income African American defendants. Until recently, possession of crack cocaine was sentenced at 100 time the length of sentences for powder cocaine, which is seen as the drug of choice for white people. It's now sentenced at an 18-to-1 ratio. Harsh drug laws require judges to give first time offenders who were caught with a small amount of drugs, including marijuana, to custodial sentences of five years, longer than that received by those convicted of violent assault or drunk driving. Police department funding depends on drug arrests for both financing and equipment, and has led to a 2000% increase in the number of people imprisoned as compared to the 1970s. And the problem isn't solved when people leave prison. Felons are ineligible for public housing. They can't vote or serve on juries. It's almost impossible for them to find a job. We've created an underclass barred from participating in society, from supporting their families, from being a useful member of society. And that underclass is overwhelmingly composed of African American men. When the United States now has a prison population of nearly the same size and proportion as Stalinist Russia during the Great Purges, you know there's something deeply wrong with this country. (We have 760 per 100,000, the Soviets had ~800.) 1.6 million people out of 300 million are in prison today in America (The Gulag held 1.7 million in 1953). That's more than all of Hawaii. This population includes almost 100,000 minors, and even an increasing proportion of the elderly. How did this happen? Racial prejudice through law is not new, of course. After the end of slavery, southern Democrats enforced racist laws, effectively cutting off the newly freed populations from voting rights, jury duty, and so forth. This was the first Jim Crow. There was a brief refuge with the Kennedy and Johnson administrations of the 1960s, and the civil rights movement. The Voting Rights Act killed the first Jim Crow, and the Civil Rights Bill and desegregation did too. However, after the assassinations of the late 1960s, when JFK and RFK and the Reverend King and Malcolm X all fell, bloodied martyrs, war riots and a fear of the loss of public order choked the American public. In 1968, Richard Nixon promised them law and order, to be 'tough on crime'. He used covertly racist advertising, setting the 'inner city' and the 'peacenik' against the 'silent majority'. He began the War on Drugs. Then came Ronald Reagan, who described welfare fraud, and whipped up racist panic about crack babies, crack heads, gangbangers. His stories were lies. Drug usage was on the decline among black communities when he made his first self-righteous crusades in 1982. But here, the laws were biased, punishing crack over powder cocaine. Crack was cheap, favored by blacks, and cocaine, used by whites, was not as heavily prosecuted. The majority of drug users are white (being the majority of the population) but the majority of those imprisoned are black. What is the state of drugs today? Drug abuse/dependence among white and black youth is roughly equal, ~8% as of 2013. However, blacks are ten times more likely to be apprehended by whites It has remained at this point since the beginning of the drug war, and even after the exponential increase in police spending in the drug war. How is the new Jim Crow implemented beyond drugs? First, through searches and seizures, and the dismantling of the 4th amendment. Second, through the pressures of the judicial system. Third, through the extremely harsh treatment which these prisoners now receive. The legal protections of the fourth amendment have been largely curtailed in the drug war. Property can be confiscated and homes invaded on unproven allegations. 'Material self-interest' allows law enforcement to target anyone, anywhere, for any reason. The judicial system has been complicit in this new aggressive policy. Mandatory minimum sentencing has led to disproportionately long sentences for even minor counts of personal possession. Heavy mandatory penalties against non-violent offenders - e.g., fifty years prison for minor amounts of personal possession, are now upheld by the Supreme Court. So there goes the Eighth amendment as well. Government privatization of the prison system, with market incentives gone perversely wrong. When prisons are privatized, what is their means of making a profit? Tacit support of 'tough-on-crime' laws, increasing prisoner intake, earning a profit by cutting out amenities, keeping their 'guests' there as long as possible. Imagine a hotel with mandatory attendance, how else would they make money? Twenty years ago, former prisoners could at least earn a living with manufacturing jobs. They'd stay out of the customers' eyes. Now, these jobs have vanished. What's left are those jobs at the very bottom, or nothing at all. I thought this would be a disturbing look a racism, but nothing new. But there were some very positive reviews in CR, so I was happy to give it a try when it showed up in my library's audio collection. It's a much more important book than I suspected. It's a major work, and has led me to shift the context of how I view the drug war and modern hidden racism. I had no idea the stuff, clearly presented here, was going on. And I'm kind of stunned that this is such a poorly covered topic. The book is wow. It's a book which you simply can't understand how important it is until you have actually read it and Michelle Alexander has a chance to fully lay this all out. Among the topics here are how the drug war focuses almost entirely on poor black neighborhoods, where up to 80% of young black males in some major cities have, at least, a police record, if not an arrest and conviction. Of how the drug war essentially ignores drug issues in white middle class suburbs, where young kids can stumble through their own experiences, while the same types of things in poor black neighborhoods lead to convictions and long jail sentences. Of the cost of a conviction, which leads to a life of limited employment opportunities, legal discrimination (because who likes a felon?) and therefore to more crime and more drug enforcement. And finally how that legal discrimination against criminals, who are disproportionately black or Latino, has become the current and painfully effective form of racism. Some of the worst parts are of the failures in police policy. How arrests are actually causing crime. And how law enforcement decisions set from higher up at the federal level set in motions policies such that police on the ground don't need to be consciously racist to, in effect, be racist. There is no racist terminology anywhere. It's strange how obvious this all seems after reading it. I have to wonder why I didn't fully appreciate this before. Why has the prison population increased four-fold between 1960 and 1990? Why do three out of four young African-American men end up in jail or prison at some point in their lives? Why was the “War on Drugs” ramped up at a time when drug-related crime was actually decreasing? Why has the “War on Drugs” been primarily waged in poor communities of color, when studies have shown that all races use and sell drugs at similar rates? Why is sentencing for crack cocaine so disproportionate with sentencing for powder cocaine? Why are local police departments given extra financial incentives to pursue drug crimes? Why were local police departments given military equipment so that they could pursue drug crimes with military policing rather than community policing, even for the most minor of drug crimes? When drug crime prisoners complete their sentences, they come out as second class citizens, no longer having the right to vote, serve on juries, and being able to be legally discriminated against in employment, housing, educations, benefits, virtually guaranteeing that their only income option would be drugs, if they come from the ghetto and return to the ghetto. Why, then are we shocked by recidivism? Since the drug problem in the ghettos of inner cities did not begin until the factories closed and jobs left, why wasn’t the drug problem attacked by bringing jobs back to these places? Why are non-violent drug issues/addictions, treated as crimes rather than health issues? It took me three years to finish this book--but that really doesn't say much in itself. In the beginning, I found it troublesome to read because of my ignorance. At the end, I found it repetitive. Alright! I get it! But even the ending had factual matter that I wasn't aware of. This is one of the most important books I have ever read. Basically Michelle Alexander shows how The War on Drugs and mass incarceration is the new racial caste. She explains how slavery began, how slavery ended, the new racist laws during reconstruction, the fall of the laws, the rise of Jim Crow, the fall of Jim Crow and then finally the rise of using the prison system to continue to target black communities and treat them like 2nd class citizens. It might sound crazy at first, Michelle couldn’t believe it at first either, but she spells it out point by point. My mind was blown. The thing is you probably already know and heard a lot of the statistics used, but seeing them all together and how they add up is shocking. 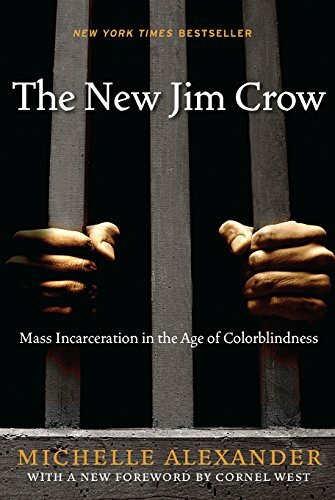 The New Jim Crow is informative of the history that cause the mass incarceration of black, the policies made under both political parties that targeted blacks by instead using the world criminals to avoid blatant racism in the public. It explains how the courts are able to continue this caste, by protecting itself with rulings that prevent people to even bring up it is racially bias. The book also explains what it truly means to be a felon, how it is legal for our country to discriminate against felons, and what it is doing to the black communities. I read this book for my PHIL 122 class (Social Justice). Overwhelmingly depressing, but convincing in its argument that after the formal dismantling of Jim Crow in 1964, a new technique to maintain a racial undercaste: the War on Drugs. Although antidrug laws are race neutral, their enforcement are not. While whites and blacks use and sell drugs at approximately the same rates, enforcement efforts target blacks to the end that mind-popping levels of incarceration never before seen on the planet have been achieved, with 80% or more of prisoners coming from minority groups. Even when released these felons are denied any benefit that might allow them to productive reintegrate into society: they are permanently denied food stamps, public housing, as well as the right to vote. They cannot find employment. The cumulative effects on the individual and the group is devastation on a massive scale. But because this is tauted as colorblind and individual responsibility, these massive incarceration works escape censure for their racist foundations and effects. This audio book was longer than it needed to be. I almost quit after the first 2 disc because she wasn't saying anything interesting/new/different. However eventually she did get to the point about how much racism there is even in folks that don't think they are racists, including blacks themselves. One example being a video game where folks needed to quickly identify thugs with guns vs. bystanders with other items, and it was like 9/10 times that a black person was the one shot incorrectly and 3/10 white folks which should have been shot where not. It is very evident that Micheele Alexander is a black Democrat writing for black Democrats. As such I'm not sure how to judge her end use. If what she missed was based on her target audience, or actually failures of her writing. She did make the correlation between poverty and incarceration, beyond race. She did note that in the "age of colorblindness" the only way the overtly racists can act is via the state. That individual racism is not tolerated. She did not make the conclusion that a free market would solve these problems, heck she didn't even go as far as to ask for a legalization of drugs. The is a huge, towering accomplishment. well reason, supported by meticulous evidence, this is A VERY IMPORTANT BOOK. What a spectacular book. I was a bit skeptical of the title going in--it's a bit Godwin-esque to compare all racial injustices to slavery and/or Jim Crow. But she addresses that head-on, with a bit of skepticism on her own part. Having recently read The Warmth of Other Suns and seen some of the ways that Jim Crow actually played out in real life, though, I could certainly see the pervasive parallels that Alexander draws here. America's prison system is incredibly racist in its implementation, that I knew. But what this book illuminates so well are the facts that (a) the system was transformed along racial lines in a discrete, systematic way and (2) the worst iniquities of our criminal justice system might actually be the lives we force felons into after prison. The concept of "civil death" underlies so many of our laws that pertain to convicted people, and it's all out of proportion to the petty crimes that most of them committed. Beyond which, it has broader implications for the black community that do, indeed, recall Jim Crow. In this book, Alexander examines the connections between the War on Drugs, racial caste, and disenfranchisement. She lays it all out with stunning clarity. This is one of the most important books I've ever read. In my opinion, it should be required reading for all Americans. Professor Alexander’s sweeping denunciation and expose of the evils of mass incarceration bring nothing to mind so much as Victor Hugo’s Les Miserables. Like Jean Valjean, a minority kid busted on a minor drug charge ends up as a felon in prison, then an outcast from our society. Laws and policies deprive him of the right to vote, of public assistance, and even of housing. Mass incarceration is leading to a new racial caste system. A clear exposition of how structural racism works in contemporary America and an expose of the cynical creation of a drug crisis and the management of the War on Drugs. Everyone should read this book. In a way it is too bad the author aligned the book so closely to Jim Crow and brought the argument forward only in terms of racism. The argument really should have less to do with racism than with poverty and a lack of hope. Yes, more blacks are in jail than other races, especially considering the racial makeup in America. Yes, the prison and policing systems are money making engines. Yes, the war on drugs is a lost cause. And, yes, probably, it was all sculpted to be the way it is. But that doesn't change the fact that it is the abject poverty and lack of hope or opportunities that is the source of the problem. Born poor and inner city, raised on the streets, attending sub-standard schools, not having any realistic hope of ever pulling yourself or your family out of it... that is the problem. If people had hope and opportunity, they would not turn to drugs or crime, and they would not get a criminal record which further condemns them to a life of poverty. The United States is as racist as it has ever been, and we are blind to it. Filled with stunning statistics, this book is one of the most important I've read lately. Did you know that the War on Drugs is actually a lightly-veiled update on the age-old institutions of slavery and Jim Crow? Did you know that more blacks could vote, and more blacks were in congress, in the time following the Civil War than they can today? Did you know that the United States imprisons more people per-capita than any other country in the world, including Iran, Syria, China, and Russia? Did you know that "felons" aren't allowed to vote, even though that represents one quarter of black males? And if the blatant racism of this system isn't compelling enough for you, then consider that there is nothing about the laws themselves that are racist, and they can actually be used to oppress any demographic. For example, Trump could use the supposed "criminal justice system" to wage a war on activists, and it would be entirely legal.